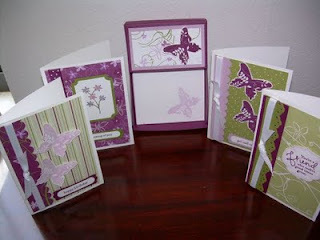 I always try to create a gift set for my senior center stamping group. Those who attend have a ready made gift when one is needed. Everyone loves something handmade these days. It is much nicer to see something handmade than a sticker saying " Made in China". This gift set will give some of the stampers who want to make additional sets time before the holiday season arrives. With the August heat here in Florida being inside and busy is a nice was to spend a day. I love the Cottage Wall paper on page 160 of the Stampin'Up Idea Book and Catalog. The warm colors of rich razzleberry, old olive and pale plum are beautiful. The finished box, four cards and envelopes will be nestled in a clear bag and tied with a ribbon just waiting to be given.